'''Padmasambhava''' (Skt. ), or '''Padmakara''' (Skt. ''Padmākara''; Tib. ''Pemajungné''; [[Wyl.]] ''pad+ma 'byung gnas'') means ‘Lotus-Born’, which refers to Guru Rinpoche's birth from a lotus in the land of [[Oddiyana]]. '''Guru Rinpoche''', the ‘Precious Master’, is the founder of [[Tibetan Buddhism]] and the [[Buddha]] of our time. Whereas Buddha is known primarily for having taught the teachings of the [[sutra]] vehicle, Padmasambhava came into this world, and to Tibet in particular, in order to teach the [[tantra]]s. While [[Buddha Shakyamuni]] exemplifies the buddha principle, the most important element in the [[sutrayana]] path, Padmasambhava personifies the guru principle, the heart of [[Vajrayana]] Buddhism, and he is therefore known as the ‘second Buddha’ (Tib. ''sangyé nyipa''). '''Padmasambhava'''<ref>Padmasambhava is actually the specific name of one of the [[Eight Manifestations of Guru Rinpoche]]. However, this name now commonly refers to all the iconographical aspects of Guru Rinpoche.</ref> (Skt. ), or '''Padmakara''' (Skt. ''Padmākara''; Tib. པདྨཱ་ཀ་ར་, [[པདྨ་འབྱུང་གནས་]], ''Pemajungné''; [[Wyl.]] ''pad+ma 'byung gnas'', in Sanskrit transliteration པདྨ་སམྦྷ་ཝ་) means ‘Lotus-born’, which refers to Guru Rinpoche's birth from a lotus in the land of [[Oddiyana]]. '''Guru Rinpoche''', the ‘Precious Master’, is the founder of [[Tibetan Buddhism]] and the [[Buddha]] of our time. Whereas Buddha is known primarily for having taught the teachings of the [[sutra]] vehicle, Padmasambhava came into this world, and to Tibet in particular, in order to teach the [[tantra]]s. While [[Buddha Shakyamuni]] exemplifies the buddha principle, the most important element in the [[sutrayana]] path, Padmasambhava personifies the guru principle, the heart of [[Vajrayana]] Buddhism, and he is therefore known as the ‘second Buddha’ (Tib. སངས་རྒྱས་གཉིས་པ་, ''sangyé nyipa''). 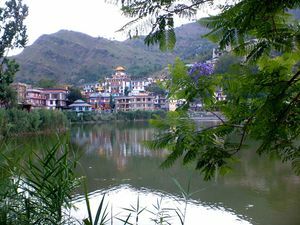 In the north-western part of the land of [[Oddiyana]], on an island in the lake of [[Dhanakosha]], the blessings of all the buddhas took shape in the form of a multi-coloured lotus flower. Moved by compassion at the suffering of sentient beings, the Buddha [[Amitabha]] sent out from his heart a golden [[vajra]], marked with the syllable HRIH, which descended onto the lotus blossom. It transformed into an exquisitely beautiful eight year old child, endowed with all the major and minor marks of perfection, and holding a vajra and a lotus. At that moment all the buddhas of the ten directions, together with hundreds of thousands of [[dakini]]s from different celestial realms, invoked the blessings and the incarnation of all the buddhas for the benefit of beings and the flourishing of the [[secret mantra]] teachings. Their invocation is known as ‘The Seven Verses of the Vajra’, or ‘The [[Seven Line Prayer]]’. It is said that his birth took place in the year of the Earth Monkey, on the tenth day of the waxing moon in the monkey month. As Guru Rinpoche was born within the lotus flower upon the waters of the lake, the dakinis called out to him from their hearts, and their call spontaneously became the [[Vajra Guru mantra]]. So this mantra is his heart mantra, his life-core, his heart essence, and to recite it is to invoke his very being. It is said that his birth took place in either an Earth Monkey or a Wood Monkey year,<ref>Discussing the date of Padmasambhava’s appearance in this world, [[Tsele Natsok Rangdrol]] says, “I find it difficult myself to identify correctly the exact years when the Buddha was born and passed away. There are many discrepancies in the various treatises, but all the histories of the Nyingma school say that Buddha Shakyamuni passed away in the year of the Fire Bird, and that Padmasambhava was born in the year of the Earth Monkey. Between these two events are twelve years, so I consider that to be the correct version.” Quoted in ''The Lotus-born'', pp.12-13. Tsele Natsok Rangdrol ''Clarifying the True Meaning'', from ''The Complete Works of rTse le rGod Tshang pa Padma Legs Grub'', Gangtok, 1979, volume 3, p. 421-2. Other sources, such as Sangyé Lingpa’s revelation, the Lama Gongdü, say that Guru Rinpoche was born in the year of the Wood Monkey. Kyabjé Dudjom Rinpoche in ''The Nyingma School'', p. 949, puts his birth in the Wood Monkey year, five years after the parinirvana of Lord Buddha, in the Iron Dragon year. </ref> on the tenth day of the waxing moon in the monkey month. As Guru Rinpoche was born within the lotus flower upon the waters of the lake, the dakinis called out to him from their hearts, and their call spontaneously became the [[Vajra Guru mantra]]. So this mantra is his heart mantra, his life-core, his heart essence, and to recite it is to invoke his very being. :My destiny, to accomplish the actions of the buddhas of past, present and future. Padmasambhava married the dakini Prabhavati and ruled the kingdom according to the Dharma, ushering in a time of happiness and peace. He was known then as King Tortokchen, ‘The Turbaned King’. Seeing that as a ruler he would be unable truly to serve others and bring them spiritual benefit on a vast scale, he begged for permission to abdicate, but was refused. So Padmasambhava employed a skilful device in order to escape. Perceiving that a harmful minister’s son was just on the point of dying and being reborn in the lower realms, he dropped his trident while dancing on the palace roof, and it caused the death of the child, who was liberated and reborn in a buddha realm. Padmasambhava was banished, and roamed in ‘The Chilly Grove’, [[Shitavana]], [[charnel ground]], and then in the other charnel grounds, ‘Joyous Grove’ and Sosadvipa. There, he received empowerments and blessings from the dakinis ‘Tamer of Mara’ and ‘Sustainer of Bliss’, and practised yogic disciplines, bringing the dakinis of the charnel grounds under his sway. The name he was known by was Shantarakshita, ‘Preserver of Peace’. Padmasambhava married the dakini [[Prabhavati]] and ruled the kingdom according to the Dharma, ushering in a time of happiness and peace. He was known then as King Tortokchen, ‘The Turbaned King’. Seeing that as a ruler he would be unable truly to serve others and bring them spiritual benefit on a vast scale, he begged for permission to abdicate, but was refused. So Padmasambhava employed a skilful device in order to escape. Perceiving that a harmful minister’s son was just on the point of dying and being reborn in the lower realms, he dropped his trident while dancing on the palace roof, and it caused the death of the child, who was liberated and reborn in a buddha realm. Padmasambhava was banished, and roamed in ‘The Chilly Grove’, [[Shitavana]], [[charnel ground]], and then in the other charnel grounds, ‘Joyous Grove’ and Sosadvipa. There, he received empowerments and blessings from the dakinis ‘Tamer of Mara’ and ‘Sustainer of Bliss’, and practised yogic disciplines, bringing the dakinis of the charnel grounds under his sway. The name he was known by was Shantarakshita, ‘Preserver of Peace’. Returning to the island in Lake Dhanakosha, Padmasambhava brought its dakinis under his command. Then, in ‘The Rugged Forest’ Parushakavana charnel ground, [[Vajravarahi]] appeared to him, and blessed him. He subdued [[naga]]s of the oceans and planetary spirits of the heavens; wisdom dakas and dakinis granted him supernatural powers and [[siddhi]]s, and he was known as Dorjé Drakpo Tsal, ‘Wrathful Vajra Might’. At ‘the Vajra seat’ in Bodhgaya, he displayed miracles, acknowledging he was a self-manifested buddha, and then he went to the land of Zahor. 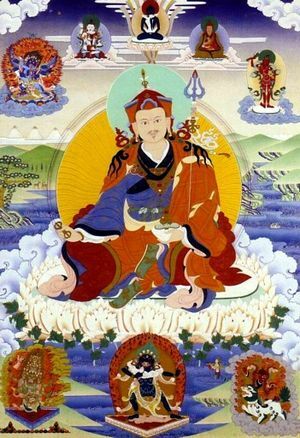 Although Padmasambhava was a fully enlightened buddha, he appeared as a [[nirmanakaya]] manifestation to tame and teach beings in this age, and so for their benefit he acted as if receiving teachings, accomplishing the practice and passing through the various stages of spiritual realization, one by one. Some accounts tell how in Vajrasana, he was ordained by the Buddha’s closest disciple, [[Ananda]]. Others say he took ordination from [[Prabhahasti]] in Zahor, and was given the name Shakya Sengé, ‘Lion of the Shakyas’. He received the teachings on [[Yoga Tantra]] from him eighteen times, and experienced pure visions of the deities. Then he received [[empowerment]] from the wisdom dakini [[Kungamo]], also known as Khandroma Lékyi Wangmo, who transformed him into a syllable HUNG, swallowed him, and passed him through her body and out through her secret lotus, granting him outer, inner and secret empowerments, and purifying the three obscurations. From the [[eight vidyadharas]] at [[Deché Tsekpa]], he received the teachings on the eight great [[sadhana]]s of [[Kagyé]], from [[Buddhaguhya]] the teachings on ‘The [[Secret Essence Tantra]]’, and from [[Shri Singha]] the teachings of [[Dzogchen|Dzogpachenpo]]. Padmasambhava would master a teaching the first time he encountered it, and experienced visions of deities without needing to practise. Attaining the first vidyadhara level, the stage of ‘the vidyadhara level of maturation’ or ‘vidyadhara with karmic residue’, Guru Rinpoche was known as Loden Choksé, ‘Wise Seeker of the Sublime’. At ‘the Vajra seat’ in Bodhgaya, he displayed miracles, acknowledging he was a self-manifested buddha, and then he went to the land of [[Zahor]]. Although Padmasambhava was a fully enlightened buddha, he appeared as a [[nirmanakaya]] manifestation to tame and teach beings in this age, and so for their benefit he acted as if receiving teachings, accomplishing the practice and passing through the various stages of spiritual realization, one by one. Some accounts tell how in Vajrasana, he was ordained by the Buddha’s closest disciple, [[Ananda]]. Others say he took ordination from [[Prabhahasti]] in Zahor, and was given the name Shakya Sengé, ‘Lion of the Shakyas’. He received the teachings on [[Yoga Tantra]] from him eighteen times, and experienced pure visions of the deities. Then he received [[empowerment]] from the wisdom dakini [[Kungamo]], also known as Khandroma Lékyi Wangmo, who transformed him into a syllable HUNG, swallowed him, and passed him through her body and out through her secret lotus, granting him outer, inner and secret empowerments, and purifying the three obscurations. From the [[eight vidyadharas]] at [[Deché Tsekpa]], he received the teachings on the eight great [[sadhana]]s of [[Kagyé]], from [[Buddhaguhya]] the teachings on ‘The [[Secret Essence Tantra]]’, and from [[Shri Singha]] the teachings of [[Dzogchen|Dzogpachenpo]]. Padmasambhava would master a teaching the first time he encountered it, and experienced visions of deities without needing to practise. Attaining the first vidyadhara level, the stage of ‘the vidyadhara level of maturation’ or ‘vidyadhara with karmic residue’, Guru Rinpoche was known as Loden Choksé, ‘Wise Seeker of the Sublime’. Returning to Zahor, Padmasambhava took the royal princess [[Mandarava]] as his consort, and they then went to the [[Maratika cave]], where for three months they practised the sadhana of longevity. The Buddha of Limitless Life, [[Amitayus]] appeared, empowered them with longevity, and blessed them as inseparable from him. They both accomplished the second vidyadhara level, ‘vidyadhara with mastery over life’. Now, the thirty seventh king of Tibet, [[Trisong Detsen]], had invited the great pandita [[Shantarakshita]], also known as Khenpo Bodhisattva, to establish Buddhism in his country. The author of the famous ''[[Ornament of the Middle Way]]'' (Skt. ''Madhyamakalamkara'') and ''[[Compendium on Reality]]'' (Skt. ''Tattvasamgraha''), Shantarakshita began teaching in Tibet, and laid the foundations for [[Samye|Samyé monastery]]. This provoked the local spirits, who embarked on a campaign of disasters—disease, floods, storms, hail, famine and drought—and whatever construction work was done at Samyé during the day was dismantled at night. Shantarakshita urged the king to invite Padmasambhava, and he despatched envoys under the leadership of [[Nanam Dorje Dudjom]]. With his prescience, Guru Rinpoche knew already of their mission, and had gone to meet them at Mangyul, between Nepal and Tibet. According to [[Dudjom Rinpoche|Kyabjé Dudjom Rinpoche]], it was in the Iron Tiger year (810) that Padmasambhava came to Tibet. It is said that he was then over a thousand years old. On the way to central Tibet, he began to subjugate the local spirits and made them take oaths to protect the Dharma and its followers. He met the king at the Tamarisk Forest at Red Rock, and then went to the top of [[Mount Hépori]] and brought all the ‘gods and demons’ of Tibet under his command. There then began a vast undertaking, an extraordinary wave of spiritual activity in Tibet. [[Vimalamitra]] and other great scholars and masters, one hundred and eight in all, were invited; Padmasambhava, Shantarakshita and Vimalamitra gave teachings, and then worked with Tibetan translators, such as [[Vairotsana]], [[Kawa Paltsek]], [[Chokro Lüi Gyaltsen]] and [[Shyang Yeshé Dé]], to translate the [[sutra]]s, [[tantra]]s and [[shastra|treatise]]s into Tibetan; the first seven Tibetan monks were ordained into the Sarvastivadin lineage, and this was the time when the two sanghas, the monastic celibate sangha of monks and nuns and the community of lay tantric practitioners, came into being in Tibet; and Vairotsana and [[Namkhé Nyingpo]] were despatched to India to receive teachings, on Dzogchen from Shri Singha, and on Yangdak from [[Hungkara]], respectively. There then began a vast undertaking, an extraordinary wave of spiritual activity in Tibet. [[Vimalamitra]] and other great scholars and masters, one hundred and eight in all, were invited; Padmasambhava, Shantarakshita and Vimalamitra gave teachings, and then worked with Tibetan translators, such as [[Vairotsana]], [[Kawa Paltsek]], [[Chokro Lüi Gyaltsen]] and [[Shyang Yeshé Dé]], to translate the [[sutra]]s, [[tantra]]s and [[shastra|treatise]]s into Tibetan; the [[seven men to be tested|first seven Tibetan monks]] were ordained into the Sarvastivadin lineage, and this was the time when the two sanghas, the monastic celibate sangha of monks and nuns and the community of lay tantric practitioners, came into being in Tibet; and Vairotsana and [[Namkhé Nyingpo]] were despatched to India to receive teachings, on Dzogchen from Shri Singha, and on Yangdak from [[Hungkara]], respectively. 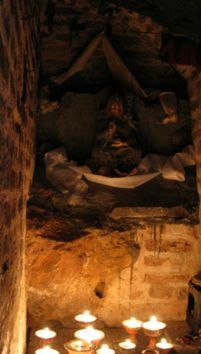 At King Trisong Detsen’s request, Padmasambhava opened the mandala of the [[vajrayana]] teachings in the caves of Chimphu above Samyé to the twenty-five disciples, headed by the King Trisong Detsen, Yeshé Tsogyal and Vairotsana; nine of the twenty-five attained siddhis through practising the sadhanas he transmitted to them. It is said that he convened them in three great gatherings, to teach the [[Kagyé Deshek Düpa]], the [[Lama Gongdü]], and the [[Kadü Chökyi Gyatso]]. Guru Padmasambhava made many prophecies about the future, and together with [[Yeshé Tsogyal]] concealed countless [[terma]] teachings, in order to: prevent the destruction of the teachings of the secret mantrayana; avoid corruption of the vajrayana or its alteration by intellectuals; preserve the blessing; and benefit future followers. For each of these terma treasures, he predicted the time for its revelation, the identity of the revealer, and those who would receive and hold the teachings. At thirteen different places called Tiger’s Lair, Taktsang, Guru Rinpoche manifested in “the terrifying wrathful form of crazy wisdom”, binding worldly spirits under oath to protect the terma treasures and serve the Dharma. Then he was named [[Dorje Drolö]], ‘Wild Wrathful Vajra’. At Shyotö Tidrö in the Drikhung Valley, the great Guru transmitted the teachings of Dzogpachenpo, the Innermost, Unsurpassed Cycle of the Category of Pith Instructions, and the Khandro Nyingtik, to a single human disciple, Yeshé Tsogyal, and a hundred thousand wisdom dakinis. Later, at [[Chimphu]], when Trisong Detsen’s daughter, the princess [[Pema Sel]], died at the age of eight, Padmasambhava drew a red syllable NRI on her heart, summoned her consciousness, restored her to life and gave her the transmission of the Nyingtik teachings, soon after which she passed away. 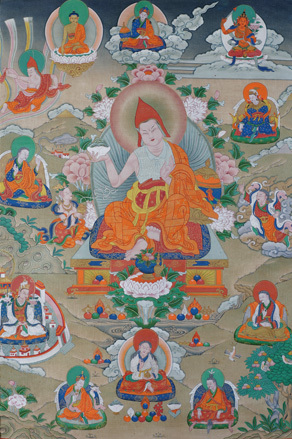 Yeshé Tsogyal concealed the teachings as terma, and centuries later, Pema Sel’s incarnation, the master [[Pema Ledreltsal]], revealed the Khandro Nyingtik cycle. His next rebirth was as the omniscient [[Longchen Rabjam]]. At Shyotö Tidrö in the Drikhung Valley, the great Guru transmitted the teachings of Dzogpachenpo, the Innermost, Unsurpassed Cycle of the Category of Pith Instructions, and the [[Khandro Nyingtik]], to a single human disciple, Yeshé Tsogyal, and a hundred thousand wisdom dakinis. Later, at [[Chimphu]], when Trisong Detsen’s daughter, the princess [[Pema Sel]], died at the age of eight, Padmasambhava drew a red syllable NRI on her heart, summoned her consciousness, restored her to life and gave her the transmission of the Nyingtik teachings, soon after which she passed away. 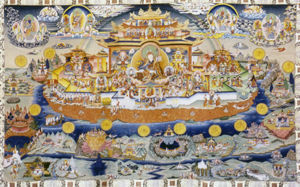 Yeshé Tsogyal concealed the teachings as terma, and centuries later, Pema Sel’s incarnation, the master [[Pema Ledreltsal]], revealed the Khandro Nyingtik cycle. His next rebirth was as the omniscient [[Longchen Rabjam]]. As regards Guru Rinpoche’s disciples, [[Jamgön Kongtrul]] lists “the original twenty-one disciples, the intermediate [[twenty-five disciples]], and the later seventeen and twenty-one disciples.” Apart from his twenty-five most famous disciples, the king and subjects, Guru Rinpoche had numerous highly realized female disciples, including the [[five principal consorts of Guru Rinpoche|five principal consorts]]: Yeshé Tsogyal, Mandarava, Shakyadevi, [[Kalasiddhi]] and [[Tashi Khyidren]]. There are many accounts of Guru Rinpoche’s life, written by great scholars or revealed by the [[tertön]]s. Some of the most famous of his biographies are the ''[[Zanglingma|Namthar Zanglingma]]'', ‘The Zanglingma Lifestory’, named after the Copper Temple at [[Samyé]] where it was discovered as a terma by [[Nyangrel Nyima Özer]], the ''[[Pema Kathang]]'' or ''Namthar Sheldrakma'', ‘The Life-Story from the Crystal Cave’, revealed by [[Orgyen Lingpa]], the ''Kathang Serthreng'' ‘Golden Garland Chronicles’ discovered by [[Sangyé Lingpa]], and the ''Namthar Yikyi Münsel'', ‘The Life-Story that Dispels Mind’s Darkness’, by [[Sokdokpa Lodrö Gyaltsen]]. Guru Rinpoche’s life is also recorded in the histories of the different teaching cycles; there exists a famous Indian version compiled by [[Jetsün Taranatha]], and biographies are even to be found in the [[Bön]] tradition of Tibet. *[[Yeshe Tsogyal]], ''Life and Liberation of Padmasambhava'', translated by Kenneth Douglas and Gwendolyn Bays, Dharma Publishing, 2008. *[[Chögyam Trungpa]], ''Crazy Wisdom'', The Collected Works of Chögyam Trungpa, Volume Five (Boston & London: Shambhala, 2004). *Dalton, Jacob. 2004. “The Early Development of the Padmasambhava Legend in Tibet: A Study of IOL Tib J 644 and Pelliot tibétain 307.” Journal of the American Oriental Society 124.4: 759-772. *[[Dudjom Rinpoche]], ''The Nyingma School of Tibetan Buddhism'', trans. and ed. by Gyurme Dorje and Matthew Kapstein (Boston: Wisdom Publications, 1991), vol. 1, pages 468–474. *Ngawang Zangpo, ''Guru Rinpoche: His Life and Times'', Ithaca: Snow Lion, 2002. *[[Nyoshul Khenpo]], ''A Marvelous Garland of Rare Gems: Biographies of Masters of Awareness in the Dzogchen Lineage'', trans. Richard Barron (Junction City: Padma Publishing, 2005), pages 41–48. *Padmasambhava & [[Jamgön Kongtrul]], ''The Light of Wisdom'', trans. by Erik Pema Kunsang (Boudhanath: Rangjung Yeshe Publications, 1986-1999), pages 43-47 & Appendix 5. *[[Tulku Thondup]], ''Masters of Meditation and Miracles'', Shambhala, 1996. *[[Yeshe Tsogyal]], ''Life and Liberation of Padmasambhava'', translated by Kenneth Douglas and Gwendolyn Bays (Emeryville: Dharma Publishing, 1978, republished 2008). *[[Yeshe Tsogyal]], ''Lotus Born—The Life Story of Padmasambhava'', Rangjung Yeshe Publications, 2004. *‘The Life of Guru Padmasambhava’ in ''[[A Great Treasure of Blessings]]'', The Tertön Sogyal Trust, 2004. *Ngawang Zangpo, ''Guru Rinpoche: His Life and Times'', Snow Lion, 2002.